U.S. Army Spc. 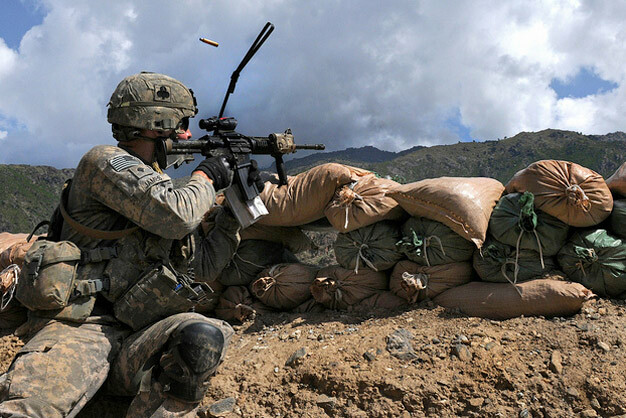 William B. James of Columbus, Ga., forward observer for 4th Platoon, Company D, 1st Battalion, 327th Infantry Regiment, Task Force Bulldog, shoots at the enemy during a more than three hour firefight at the Shege East Afghan National Police Checkpoint Sept. 18. Photo by U.S. Army Staff Sgt. Gary A. Witte, 300th Mobile Public Affairs Detachment. Photo via U.S. Army.